Didn't know that - thanks! 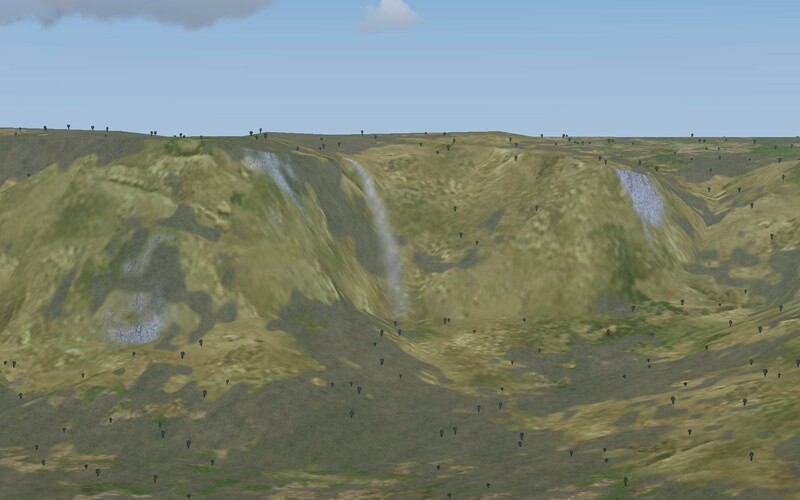 Apologies for the bump, is there any way to get a waterfalls "object" in scenemodels so they can be placed throughout the world generically? Or is this purely experimental? I was asked to submit the waterfalls per PM, since the weboform doesn't work for effects - which I did. I don't know what happend since. Still on my to-do list for now, I'll keep you up to date. Geysers would also be absolutely fantastic, if we can figure that out. Does it works in 2.10? but it didn't change the scenery. Yes - actually ships with 2.10, so you shouldn't need to do anything to see Auyantepui as in the pics. Are you using the regional texture set (check the rendering dialog)? it is not same with your result. what's wrong with my setting? 1) Make sure you 'Reload Scenery' after selecting region-specific textures, otherwise it's not changed. 2) In the default rendering scheme, the crop shader effect (which is the fields and brown you get to see) overrides all regional definitions. To get pretty much exactly what is in my screenshots, check the Atmospheric Light Scattering box (this selects an alternative rendering scheme which uses overlay texture definitions). If you do not like that, check the box 'Custom settings' and play around with the individual shaders - at least you need to switch the crop effect off in order to see any regionalizing of the textures. Note that the default rendering scheme does not support overlay texturing, so you will see regional definitions then, but only the base texture. Now the important question in return: How should the GUI have been like in order to make this more intuitive for you? My true apologies to Thorsten for the delay in integrating this data into Scenemodels. This is now done, so you can enjoy this wonderful landscape via Terrasync. I forgot to delete a small pylon indicating the place at Salto Angel, it will be deleted this evening. Enjoy, it's worth the fly! Just droped in to FG with the ufo to have a look, I really like it great stuff.